On Monday, December 18, 2017, I took a walk up to the summit of Mount Glory in the Southern Teton Range. Our original objective was to take snowpack observations in the Great White Hump area. The wind and obscured visibility suggested that there were better days in the future to do so. Surface conditions varied greatly between aspect and elevation. Out of the 7 observations above the only desirable one is unsettled powder….and lately we’ve only seen a skiff to a few inches and the wind is having it’s way with it. The other surfaces includes good sliding surfaces and a persistent weak grain types. 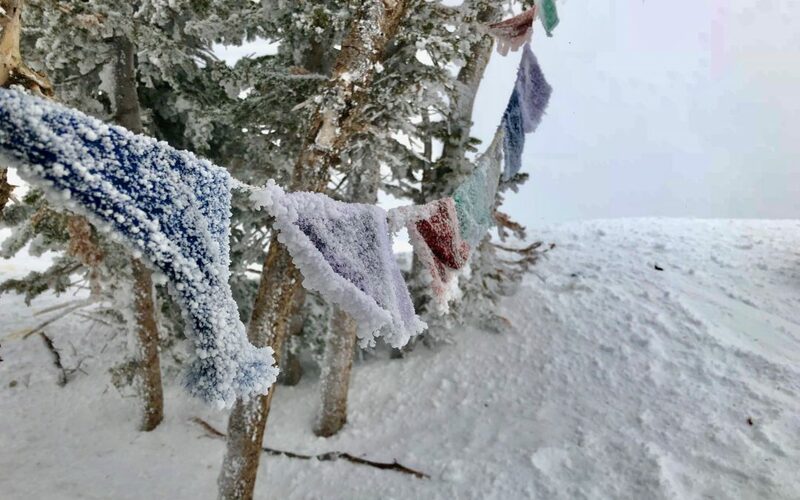 The most important take away is there are a variety of weak layers and good bed surfaces to promote avalanche release in the event of a load. The next take away is where those sliding surfaces are. Start zones were blasted by winds creating very slick/hard surface forms. Or more simply…if we get significant accumulation we should expect a sporty sport avalanche cycle to ensue. 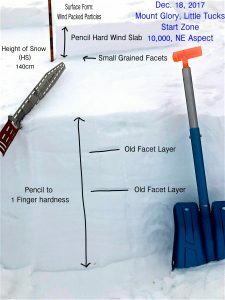 These factors should cause folks to pause and weigh these factors into decision making around avalanche terrain. Keep an eye on the weather forecast with the oncoming storm. Any significant accumulation and wind will heighten avalanche hazard which included consequence. Uncertainty, lower angle terrain, ridge-lines and trees make for good ski partners. When decision become difficult, choose simpler and easier terrain to manage. The best skiing in the coming weeks, in my opinion will be on lower angle slopes and wind protected areas. Why low angle? You will be less likely to hit the crust when making turns and lower snow accumulations ski better on lower angle terrain. I will also be looking for “the smooth”. Slopes that haven’t been skied and chopped up will definitely ski better with a few new inches of new snow. South faces will surely have a stout crust. Lower angle south face that are smooth and low angle might provide really fun turns if we get anything better than 6 inches. Wind affected snow? Since when is wind affected snow fun to ski? Keep it safe out there and check in with the Bridger Teton Avalanche Center for up to date information on snow, weather and avalanche conditions!